Well I have finally finished my reports, just getting proofread now before putting them in envelopes to go home this Friday! These reports were just excruciating to do because of Victoria's new format of report writing (so bland and in a way unfair to the kiddies)....but they're outta my hair ....for now. Next thing to tackle is Parent teacher interviews on Monday next week, but I always find they go well, luckily! 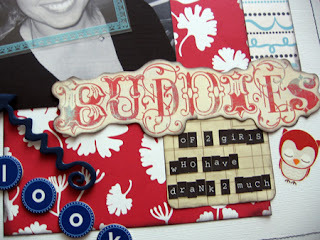 Onto scrapping, well I have been quite a busy bee this weekend! Saturday night, after Carmen left, I was bout ready for bed. But I hadnt scrapped all weekend so thought I better give it a go! It was 9pm when I started and I crawled into bed at 2am after finishing 3 pages and nearly finishing a mini album!! I was wrapped and the pages came together so quickly! 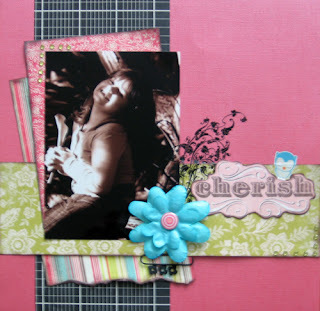 Products used: Bazzill bling cs, My Minds Eye pp, Mustard Moon pp, My Minds Eye title, Basic Grey rub on, Carolees creation paper clip, Sassafrass Lass rub on, Making Memories flower, Kaiser craft jewels. This next page was for the June 123 Cyber Crop-Challenge 1. I used a sketch from Forever Always (sketch november 06), title 'The Look' Roxette used to be my favourite band when i was younger!! and white cardstock. Me and one of my good friends at a hens night :) We do not drink as often as we used to and find it hits us a lot quicker, although this piccie is black and white I had the rosie cheeks happening quickly that night!! 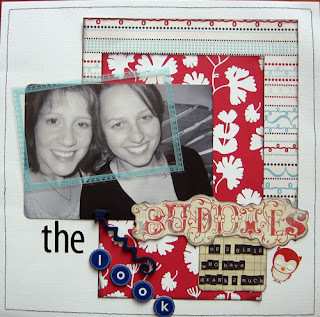 Products used: Sassafrass Lass pp, My Minds Eye pp, Heidi Journal tabs, My Minds Eye title, EK Success letter stickers, Doodlebug letter stickers, Queen and Co chip alphabets, Sassafras Lass rub ons, My Minds Eye transparency, Chipboard Arrow. I also completed another page for my Book of ? challenge at Bons. And I nearly finished a Brag book for a lady at works friend. I have had this little job to do for a while, but was having trouble because I didnt know if the baby was a boy or a girl + I also did not have any pics. 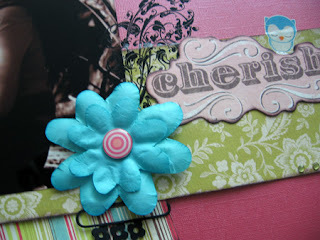 What I have ended up doing is putting photo mats on the pages, with embellies around. I hope she likes it! I will post it when its fully done. I drove mum and my bro and his g/f to Heidleberg today to see my uncle. He has a tumour in his chest, and thankfully it shrunk a little with chemo. However he is having radiation and it is really knocking him around. It was really nice to see them all and he does look well, considering....Hopefully we can make another trip out there soon. Hoping to catch up with Carmen to scrap one night during the week......and also my aunty and I have booked into a retreat in September!! And we have a Scrap and Chat day with Bons Scraps on July 14th in Belgrave, after booking in we realised we have our retreat in Daylesford is the next w/end, oh well, its a bit naughty!! But what a better excuse to shop than a retreat!! I always spend up on supplies before them.